The 5th G.O.D. Awards announces its HUMANITARIAN ICON OF AFRICA in the illustrious personality of Dr. Samuel "Amo"Tobbin, Chairman of Tobinco Group of Companies and Samuel Tobbin Foundation. Princess Maria Amor, founder and president of We Care for Humanity and Chairman of the G.O.D. Awards declares: "Humility is a curious prerequisite for any philanthropist. Without humility, successful people tend to lose their path and overindulge of their misguided fruits of success. Consequently, failure is what propel great leaps forward to teach a valuable lesson. To understand that compassion and faith are not signs of weakness and despair, but tools to help realize the potential of helping a fellow person. These are the qualities that composes a standard that is needed to elevate humanity. The most wonderful trait a humanitarian has is the spirit to help realize the potential of the fellow human. Mr. Samuel Tobbin you have crossed the road of success and while strengthening Tobinco Group of Companies you have innovatively created opportunities and empowered communities with the Tobinco Foundation. In a thanksgiving speech, you stated Use Dialogue Not Violence, your intrinsic philanthropic prowess is what distinguishes the typical businessman from you, a bonafied humanitarian. From helping children with scholarships, to empowering widows to be active agents of change in Ghana. It is even clearer that your humility and selflessness has brought happier lives for the children, women and widows of Ghana and a better future for all of humanity. Your Excellency Samuel Tobbin, I have the great pleasure to announce that the 5th Global Officials of Dignity (G.O.D.) 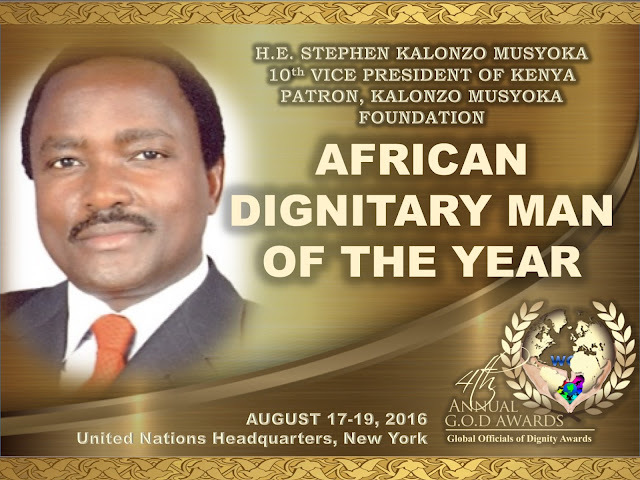 Awards Committee have reached a unanimous decision to recognize His Excellency as HUMANITARIAN ICON OF AFRICA. It is our strong belief that your accomplishments and distinct caliber of talents should be shared with at the United Nations, New York." Mr. Samuel Amo Tobbin, Executive Chairman of TPL has over 20 years experience in managing business. He is the Executive Chairman of The Tobinco Group Of Companies which includes: Pharmaceuticals, Cosmetics, Banking, Insurance, FM station and many more. He has previously solely grown Tobinco Company Limited in General merchandises. As a business strategist and an entrepreneur, Samuel Amo Tobbin has been the engine which is growing his company from strength to strength. 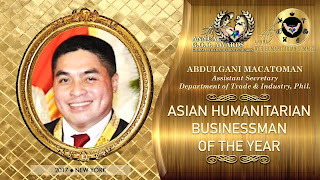 He has undergone an extensive training in Finance, Management and Strategic Planning with hands on experience to run his business efficiently. He was recently nominated for an Honorary Doctorate Degree from a University in Denmark for his experience in Business Management and Strategy. In 2008 Tobinco Pharmacy was honoured by the Ghana Private & Dental Association for the most TRUSTED brand – ALAXIN August 2011. 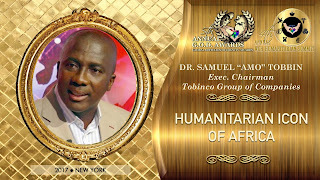 Mr. Samuel Amo Tobbin was adjudged the marketing man of the year, 2010. Popular anti-malaria drug, ‘Lonart,’ produced by Tobinco Pharmaceuticals, one of the leading pharmaceutical companies in Ghana, was adjudged The Chartered Institute of Marketing Ghana (CIMG) product of the Year, 2014. He has a passion for the vulnerable and the needy in society. Some of his Social Responsibility Projects include: Provision of one thousand five hundred (1,500) Health Insurance Cards for women and children in Accra, The building and furnishing of an ultra – modern office complex for The Ghana Police Service at Kotobabi District in the Greater Accra Region and Instituted a scheme that pays monthly stipend to about two hundred (200) widows in the Church of Pentecost and many others. He is a family man married to Mrs. Mercy Tobbin with 3 lovely children. The 5th G.O.D. Awards announces its LIFETIME ACHIEVEMENT ON PHILANTHROPY and PUBLIC SERVICE AWARD Honoree in the illustrious personality of Honorable Kennedy Ohene Agyapong, Member of Parliament of Ghana. Princess Maria Amor, founder and president of We Care for Humanity and Chairman of the G.O.D. Awards declares: "Success is the survival of an adventurous maze. A meandering journey that one hopes, with much effort, will brew prosperity. Your Excellency’s indomitable perseverance in life’s twists and bends is laudable. The ability to execute of ideas, while being creative, taking risks, and with the vigor of enjoying life is nothing to overlook. You are no stranger to the qualities needed for success, as well as rectifying disparities for other to flourish as well. You dedicated your life to become a politician to innovatively create opportunities and strengthen communities. The prelude of a great philanthropic leader is the discovery of true courage. A trait that cannot be measured by the absence of fear or heaps of victory but rather the urging to always try again amongst adversity. You lifted the people of Ghana by providing educational Assistance to pupils and students, mothers and children, job creation for numerous Ghanaians, School Building projects in Ghana and other countless contributions. Regardless of triumph or despair, it is the unwithering desire that is molded by the consensus to always try again for the sake of humanity. accomplishments and distinct caliber of talents should be shared with at the United Nations, New York." 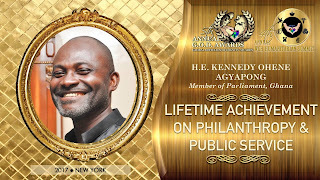 Agyapong Ohene Kennedy is a Ghanaian businessman, farmer and a politician born at Assin Domprem in the Central Region of Ghana on June 16, 1960. He holds a minority seat in parliament as member of the New Patriotic Party NPP, representing the Assin North in the Central region. The Assin Domprem boy began schooling trying to catch up with his peers at age 16. He was in Form 1 at 11 year at Adisadel College in 1976. Having closed the door on Adisadel College, he proceeded to Winneba Secondary School then on to Fordham University. Today, Adisadel College is proud to have awarded him thrice during the school's 100th anniversary - a program he says Owula Mongotey was missing in action. He holds a General Certificate of Education (GCE) ‘A’ Level which he obtained in 1983. He furthered to the Fordham University New York, USA. He later worked at the Assin Farms as a Managing Director. He worked at the Super Care Group of Companies, He worked at the Hollywood Shopping Center, and He is currently the Member of Parliament for the Assin North constituency from January 2001 till date. The 5th G.O.D. 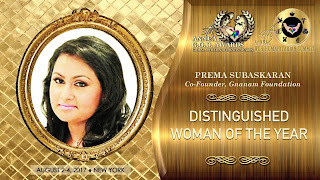 Awards announces its DISTINGUISHED WOMAN OF THE YEAR in the illustrious personality of Ms. Prema Subaskaran, Co-Founder of Gnanam Foundation and Chairman of LycaHealth. 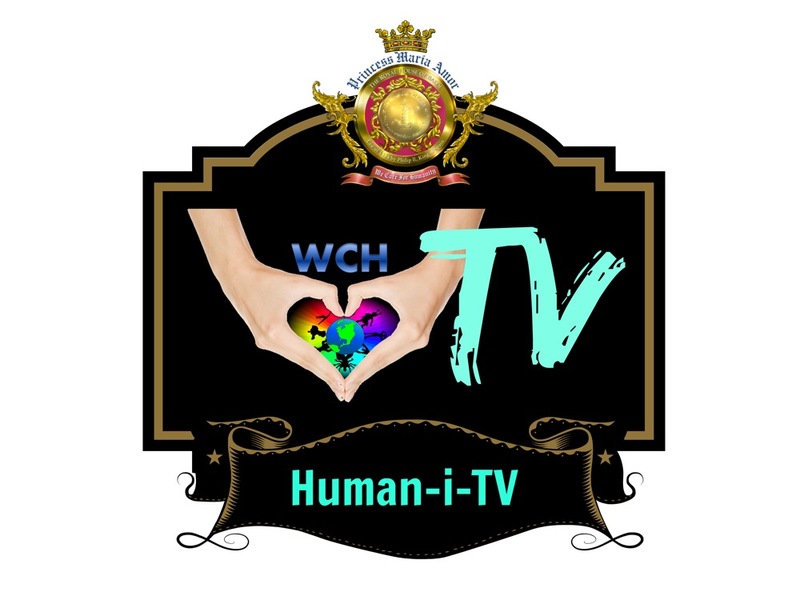 Princess Maria Amor, founder and president of We Care for Humanity and Chairman of the G.O.D. Awards declares: "Humility is a curious prerequisite for any philanthropist. Without humility, successful people tend to lose their path and overindulge of their misguided fruits of success. Consequently, we gain wisdom and humility more readily through our failures. The most frightening concern with failing is knowing it is a battle. A rigorous battle to maintain resilience; the ineffable ability to overcome opposition and misfortunes and still, returning stronger than ever, for the sake of humanity. To succeed In Life you must know that the same sun that melts the wax, hardens the clay. The most wonderful trait a humanitarian has is the spirit to help realize the potential of the fellow human. Ms. Prema Subaskaran, you have crossed the road of success and while strengthening the Gnanam Organization you have innovatively created opportunities and empowered communities. Your intrinsic philanthropic prowess is what distinguishes the typical businesswoman from you, a bonified humanitarian. What makes you a great leader is having the humility and compassion to manifest your dreams into a goal without malevolence or greed that benefits the greater good of the people. Ms. Prema Subaskaran, I have the great pleasure to announce that the 5th Global Officials of Dignity (G.O.D.) Awards Committee have reached a unanimous decision to recognize Her Excellency as the DISTINGUISHED WOMAN OF THE YEAR. It is our strong belief that your accomplishments and distinct caliber of talents should be shared with at the United Nations, New York." Mrs Prema Subaskaran is the Chairperson and of LycaHealth. She is also a Director of a number of companies within the Lyca Group. With a degree bio-medical sciences, Prema is an entrepreneur with a passion for philanthropic, medical & community projects that are designed to support the most vulnerable people and communities across the world. 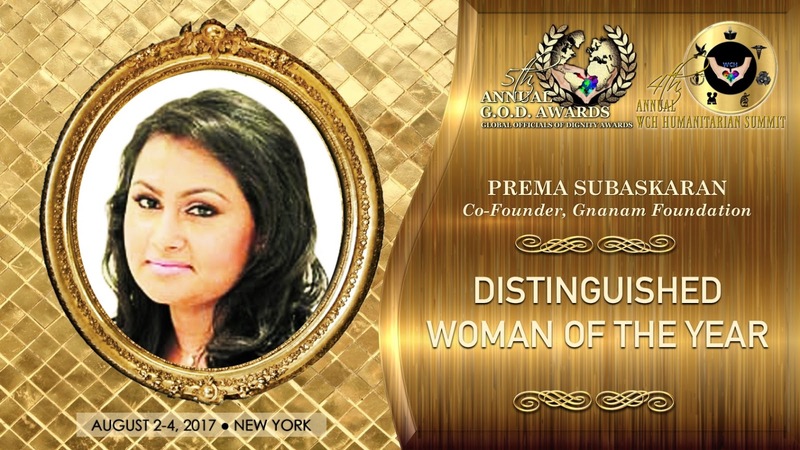 In addition to her position at LycaHealth, Prema is also a trustee of the Gnanam Foundation which is the charity arm of the Lyca Group founded by her husband and chairman, Subaskaran Allirajah. Her vision for the Foundation is to develop the skills of under-privileged and the vulnerable people to give them access to opportunities that would otherwise be unattainable. Lycahealth is a new, customer-centric healthcare venture that brings top consultants to all its clinics specialising in a comprehensive array of medical conditions. These specialities range from cardiology, neurology, neurosurgery, gynaecology, gastroenterology, general surgery and orthopaedics to physiotherapy, sports medicine, chest medicine, sleep disorders, ENT and more. Additionally, LycaHealth offers access to the best MRI and low radiation CT scanners, digital X-ray, ultrasound, and more including routine investigations. All patient healthcare records are accessible by both the patient and their clinicians anywhere in the world. Operating an “Apple store” type experience, patient’s satisfaction is paramount. Lycahealth is accredited by all private insurers. The 5th G.O.D. 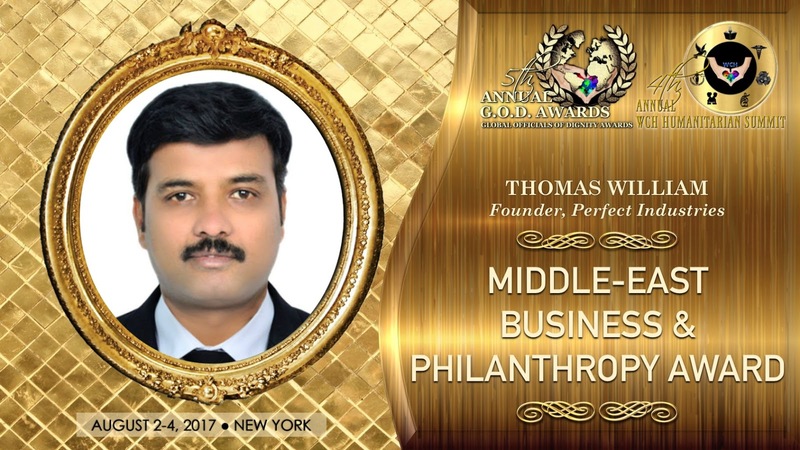 Awards announces its 2017 MIDDLE-EAST BUSINESS & PHILANTHROPY AWARDS in the eminence person of Mr. Thomas William, Co-Founder of Perfect Industries, Dubai. The most wonderful trait a humanitarian has is the spirit to help realize the potential of the fellow human. Mr. Thomas William you have crossed the road of success and while strengthening Perfect Industries you have innovatively created opportunities and empowered communities. Your intrinsic philanthropic prowess is what distinguishes the typical businessman from you, a bonafied humanitarian. It is even clearer that your humility and selflessness has brought happier lives for the children and underprivileged people of India and elsewhere. Mr. Thomas William, I have the great pleasure to announce that the 5th Global Officials of Dignity (G.O.D.) Awards Committee have reached a unanimous decision to recognize you with 2017 MIDDLE-EAST BUSINESS & PHILANTHROPY AWARD. It is our strong belief that your accomplishments and distinct caliber of talents should be shared with at the United Nations in New York." The 5th G.O.D. 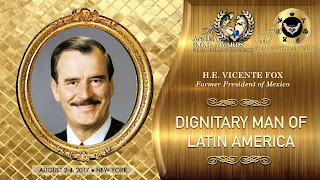 Awards announces its 2017 LATIN MAN OF AMERICA in the eminence person of His Excellency Vicente Fox Quesada, the 55th President of Mexico. Princess Maria Amor, founder and president of We Care for Humanity and Chairman of the G.O.D. Awards declares: "From growing up on ranch in Guanajuato to becoming the leader of a colorfully diverse, richly cultured and persevering nation, you have always had the heart and concern of your people as a priority. Perhaps it is in your humble and tangible origins that has transformed your love of humanity into a greater and positive lasting impact in our world. An unwavering drive to elevate not only yourself, but the entire country of Mexico. Your compassion for change and transparency honed an amalgamation of skills that are needed to run a government and become what is defined leader. Leadership, a profound position where true intentions would be revealed by action. What makes you a great leader is having the compassion and determination to manifest your dreams into a goal without malevolence or greed. A rigorous battle to maintain resilience; the ineffable ability to overcome opposition and misfortunes and still, returning stronger than ever, for the sake of fellow paisanos. Your Excellency, it is your personable and amiable style, your gracious and warming charisma, your numerous endeavors whilst leading the Mexican Nation and your magnanimous efforts in youth education, peace, and leadership advocacy that I have the pleasure to announce that the 5th Global Officials of Dignity (G.O.D.) 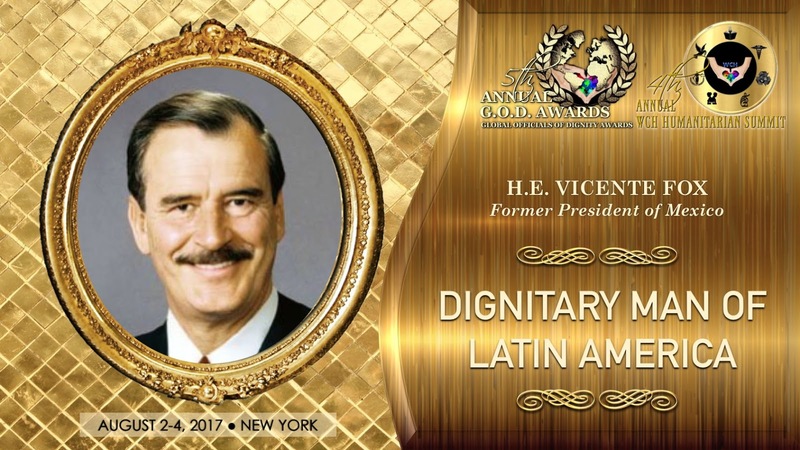 Awards committee have reached a unanimous decision to recognize His Excellency, Vicente Fox Quesada, as the 2017 DIGNITARY MAN OF LATIN AMERICA. It is our strong belief that your accomplishments and distinct caliber of intrinsic leadership should be shared with and celebrated before the global audience at the United Nations". ​Vicente Fox, in full Vicente Fox Quesada (born July 2, 1942, Mexico City, Mexico), Mexican businessman and politician who was president of Mexico from 2000 to 2006. His term in office marked the end of 71 years of uninterrupted rule by the Institutional Revolutionary Party (PRI). Fox, the second of nine children, was raised on a 1,100-acre (445-hectare) ranch in the state of Guanajuato, Mexico. He earned a degree in business administration from the Ibero-American University in Mexico City and later became a route supervisor for the Mexican unit of the Coca-Cola Company. After a series of promotions, he served as the company’s chief executive in Mexico and then head of its Latin American operations. In 1979, however, he resigned and returned to Guanajuato. As Mexico’s economy struggled in the 1980s, Fox became convinced that the country needed new leadership, and he turned to politics. He joined the National Action Party (PAN) in 1987 and the following year was elected to the national Chamber of Deputies. After losing a controversial gubernatorial election in Guanajuato in 1991, he ran again and was elected in 1995. In 2000 Fox ran for president on a platform that focused on ending government corruption and improving the economy. At the polls he easily defeated PRI candidate Francisco Labastida Ochoa, and on December 1, 2000, he succeeded Ernesto Zedillo as president of Mexico. Fox focused his early efforts on improving trade relations with the United States, calming civil unrest in such areas as Chiapas, and reducing corruption, crime, and drug trafficking. In 2001 his administration introduced constitutional reforms that strengthened the rights of Mexico’s indigenous peoples. Although the measures were ratified by the necessary number of Mexican states, seven other states—including Chiapas, where more than half the indigenous population lives—rejected them. Advocates for indigenous rights objected to amendments that required indigenous peoples to act in accordance with the constitution and that reduced their autonomy in some spheres. Leaders of the Zapatista National Liberation Army in Chiapas—who had made constitutional reform a condition of their return to peace talks—also opposed the new law. In economic affairs, Fox’s proposals, particularly his plans to increase taxes as part of sweeping reforms to stabilize the Mexican economy and banking system, met fierce resistance in the Mexican legislature, where the PAN lacked a majority. There was significant progress early in Fox’s term toward bilateral cooperation with the United States on drug trafficking and illegal immigration, but the U.S. administration was skeptical of Fox’s calls for open borders with the United States and for the protection of the rights of undocumented Mexican workers (Fox was later criticized for statements perceived as encouraging illegal immigration). At the same time, Fox’s opponents faulted him for aligning Mexico too closely with the United States, a sentiment reflected in the vote of the Mexican Senate in 2002 to block a planned visit by Fox to the United States. The PAN’s lack of a majority in the Mexican legislature hampered Fox’s ability to secure enactment of his reform proposals. Although Fox’s personal popularity remained high, there was disillusionment with the slow pace of reforms, and farmers staged widespread protests over the perceived failure of the Mexican government to address agricultural inequities caused by the North American Free Trade Agreement. As a result, in the 2003 legislative elections the PAN suffered major losses to the PRI, further eroding Fox’s ability to push through his reforms. In 2004 Fox’s wife, Martha Sahagún de Fox, briefly considered seeking the Mexican presidency (Fox was constitutionally ineligible for a second term), but her potential candidacy aroused considerable hostility in the public as well as among political leaders. In 2006 Fox left office, succeeded by Felipe Calderón of the PAN. The 5th G.O.D. 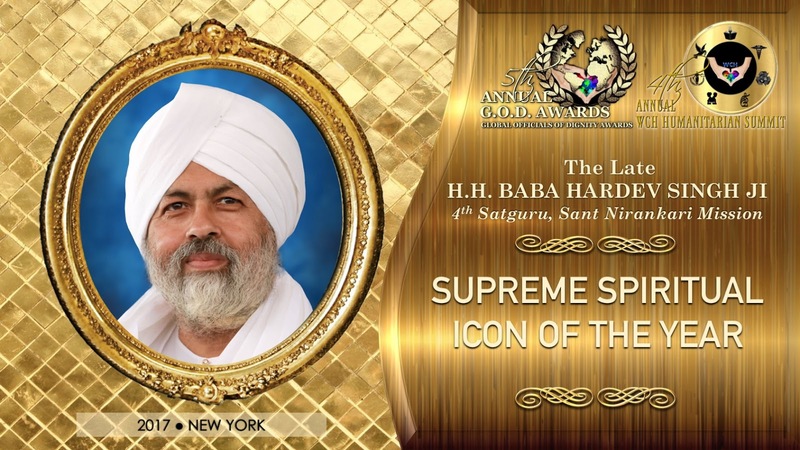 Awards announces 2017 SUPREME SPIRITUAL ICON OF THE YEAR in the person of His Holiness, the late Baba Hardev Singh Ji, the 4th Satguru of Sant Nirankari Mission. Princess Maria Amor, founder and president of We Care for Humanity and Chairman of the G.O.D. Awards declares: "Love is the greatest unifier and spiritual denominator for the soul of humanity. It is the moral compass that perpetually navigates us through the darkest of our days and transcends what our physical means cannot. For the greater portion of our lives, we struggle to find our wealth but a wealth that is greater than our brief existences is found in the accomplishments we make in life, in bettering ourselves and the ones around us. And while the future may be cast in shadow, faith is what keeps up moving forward when what lies ahead is unforeseeable. The incredibly wonderful trait each individual has is the spirit to help realize the potential of the fellow human. His Holiness Baba Hardev Singh’s contributions to world has irrefutably won countless battles and will forever provide humanity a source of direction when needed. The late Guru Baba Hardev Singh may no longer be with us but to live in hearts, we leave behind is not to die- Thomas Campbell. His Holiness Baba Hardev Singh’s compassion and love for humanity is embedded in our hearts and fellow Niranakri’s worldwide. I have the tremendous honor to declare that the G.O.D. Awards Committee have reached a unanimous decision to recognize His Excellency as 2017 SUPREME SPIRITUAL ICON OF THE YEAR. It is our strong belief that his accomplishments and distinct caliber of talent should be shared with and forever remembered before the global audience at the United Nations this 2017." Baba Hardev Singh Ji was born on February 23, 1954 in Delhi in the family of Baba Gurbachan Singh Ji and Rajmata Kulwant Kaur Ji. As a child, Hardev was very fortunate to have worldly as well as spiritual blessings of his parents and also the then Satguru Baba Avtar Singh Ji and Jagatmata Budhwanti Ji as his grandparents. With the growth of child Hardev, grew his thoughtfulness and sobriety. He saw every object and observed every event with due curiosity but used to keep silent. Respect and regards for elders and the trait of humility could be noticed in him from the very childhood. Interest in congregations and listening to discourses of Satguru also became conspicuous in him. The kind and pure hearted child Hardev was never found spendthrift and emotional. Baba Hardev Singh Ji received his elementary education at home. Thereafter, he studied ats Rosary Public School, Delhi. In 1963, he was sent to the Yadvendra Public School, Patiala, a boarding school and an institution of national fame, from where he passed the high school examination in 1969. His co-operative and compassionate nature made him popular with the teachers and the fellow-students alike. His school education was equally supplemented and cemented with spiritual touch received through the letters of his affectionate mother, Rajmata Kulwant Kaur Ji. During his stay in the school, he also developed keen interest in mountaineering. This hobby added the trait of patience and perseverance in his life. He was never found tired or worried. He was also very skilful in vehicle driving, horse-riding and took keen interest in photography. On completion of his school education at Patiala, Baba Hardev Singh Ji returned to Delhi and started further education under Delhi University and also took keen interest in the socio-spiritual activities of the Mission. He became very regular in congregations (Satsang) and service to others (Sewa). His humility earned him the name 'Bhola Ji'. In 1971, He joined the Nirankari Sewa Dal as its primary member and enjoyed himself serving in cotton Khaki (brown) uniform. He organized "Youth Forum" in 1975, which focused on promoting truthful and simple living, service with devotion and love, refraining from incurring undue expenses and practicing prohibition. On the eve of the 28th Annual Nirankari Sant Samagam in Delhi, on November 14 in 1975, Baba Hardev Singh Ji was married in a simple ceremony to Savinder Ji, daughter of devoted saints Shri Gurumukh Singh Ji and Smt. Madan Ji of Farrukhabad, Uttar Pradesh. Born on January 12, 1957, Savinder Ji was well educated and duty conscious. Baba Hardev Singh Ji became the spiritual mentor of the Mission when its Spiritual Master and a crusader for unity, peace and truth Baba Gurbachan Singh Ji had fallen to the bullets of some fanatic elements on April 24, 1980. Immediately after the cremation of the mortal remains of Baba Gurbachan Singh Ji at the electric crematorium in Delhi on April 27, 1980, Young Hardev was greeted and hailed as the Head of the Mission and everybody present witnessed the Satguru already manifested in Him. Baba Hardev Singh Ji, who was known for his calm nature, addressed the devotees as a perfect Spiritual Master. He said "Baba Gurbachan Singh Ji's martyrdom is the will of God. Perceptions differ from people to people. The ignorant say that it may lead to bloodshed but the devotees believe that being a supreme sacrifice, it shall usher in peace and harmony." He ruled out even the remotest thought of vengeance saying that 'it would go contrary to what Baba Gurbachan Singh Ji lived and sacrificed his life for'. He exhorted devotees to carry on His message of compassion, goodwill, love, truth and peace and pray for the welfare of one and all. The result was quite instantaneous and healthy. The devotees remained non-violent even in the face of serious provocations from fanatics. And when the day (24th April) came in 1981, Baba Ji ordained it to be observed as Manav Ekta Divas (Human Unity Day) and not as Martyrdom Day. The first holy discourse by Baba Hardev Singh Ji had far greater and much deeper significance and from the message contained therein, one could understand his vision of peace for the time to come. He gave call to His devotees to continue to spread the message of love and peace and pray for the goodwill of all.